Our Area 51 Laser Tag hire is a mobile inflatable maze used for non-contact laser tag battles. 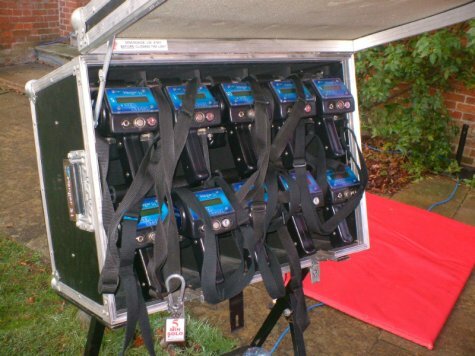 It's a recent addition to our hire range and brings the fun of the laser tag arena to your very own event venue. It can be used both indoors and outdoors and is suitable for participants age 7 to adult. Laser Tag is a non-contact game that can be played by up to ten players at a time either as individuals or teams. It's a great game for fun days, team building, schools and youth groups and can be played by anyone aged 7 upwards. The laser guns are totally harmless using infra-red beams that are pretty similar to those of a TV remote control. The guns produce sound effects, and will register and keep score of your successful shots at your opponents together with the number of times you've been hit yourself. Inside the maze it's pretty dark with only limited light getting in through coloured roof panels - this together with the optional smoke effects make for some great atmospheric battles. For the safe operation of our laser tag we require a level area of 45x38ft overall - if outdoors this needs to be on a grassed surface. We can only operate on a hard surface if it's indoors. A mains electric supply will be required within 50metres although we can supply a suitable generator if this isn't available - this can be arranged at the time of booking. A similar alternative to Laser Tag is our Combat Archery arrow tag game. Suitable for ages 7 - adult. Supplied with trained staff to run the game for you. Requires overall space of 45x38ft. Can be used indoors or outside. Alcester, Alderley Edge, Alfreton, Ashbourne, Atherstone, Bakewell, Banbury, Beaudesert, Bedworth, Birmingham, Bridgnorth, Bromsgrove, Burton upon Trent, Buxton, Cambridge, Cheadle, Cheshire, Chesterfield, Cotswolds, Coventry, Crewe, Derby, Derbyshire, East Midlands, Edgbaston, Evesham, Gloucester, Grantham, Greater London, Henley in Arden, Herefordshire, Hinckley, Ilkeston, Kenilworth, Kettering, Kidderminster, Knutsford, Leamington Spa, Leicester, Leicestershire, Lichfield, London, Loughborough, Lutterworth, Mansfield, Matlock, Melton Mowbray, Middlewich, Milton Keynes, Nantwich, Newark, Newcastle under Lyme, Northampton, Northants, Nottingham, Nuneaton, Oxford, Oxfordshire, Redditch, Rugby, Sheffield, Shrewsbury, Shropshire, Solihull, Stafford, Staffordshire, Staffs, Stoke on Trent, Stratford Upon Avon, Sutton Coldfield, Swadlincote, Telford, Uttoxeter, Warwickshire, West Midlands, Wolverhampton, Worcester, Worksop. Please click here to enquire and we will do all we can to help - it costs nothing to ask for a quote!